We charge £700 for two 45min sets with a break in between the two sets. 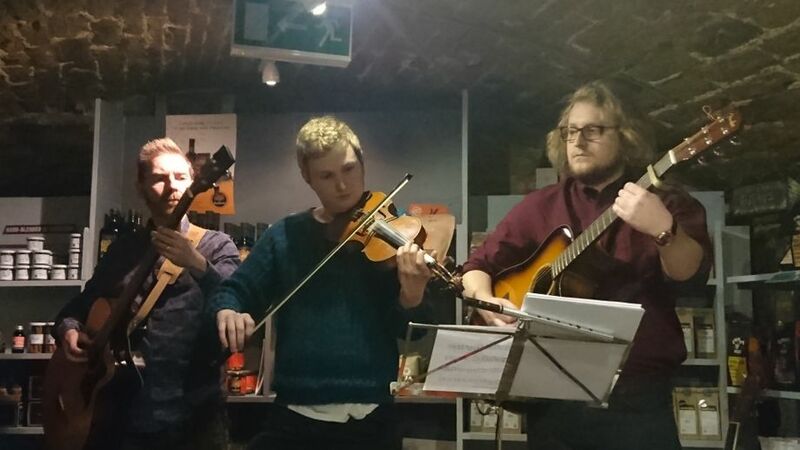 Folk quartet Trouble at t'Mill have been playing private and public gigs since the band's formation in August 2015. The band is fully-equipped with a 1000W PA rig - plenty loud enough to fill a medium-large venue. "We have an extensive catalogue of music, fit for any occasion or venue, ranging from rousing drinking songs, reels and jigs to slow airs and melancholy folk songs. Our arrangements are fun and fluid and filled with energy and we are available to provide live music for corporate and private functions, pubs, bars, restaurants and festivals.."
One break. Usually around 20 to 30 minutes. We need enough space to set up our equipment and play comfortably. Usually around 6 feet by 4 feet will be fine. We do not carry our own Public Liability insurance. Our equipment is not currently PAT tested. We are in the process of arranging PL and getting our equipment PAT tested. Yes. We have our own 1000W PA system. Usually, an hour and a half. We are, however, available to play longer or shorter sets as required. Bank Transfer (50% must be paid up front), PayPal (50% must be paid up front), cash. Pubs, bars, charity events, community events. Contemporary five-piece folk band specialising in modern settings of traditional Irish and Scottish folk songs and tunes.